A great little promo about HLAA! It’s a little long, but covers every aspect of “who, what, where, why, and how” of HLAA. So that is less than 6% who have a visible illness. There are many illnesses that start out being invisible and as the disease progresses it becomes more visible. yet, only 7 million persons used a visible device for mobility. Thus, 19 million of the people who were defined as severely disabled, did not use a wheelchair, cane, crutches or walkers. In other words, 73% of Americans with severe disabilities do not use such devices. Therefore, a disability cannot be determined solely on whether or not a person uses visible assistive equipment. U.S. Department of Commerce (1994). Bureau of the Census, Statistical Brief: Americans With Disabilities. (Publication SB/94-1).U.S. Department of Commerce (1997). Bureau of the Census, Census Brief: Disabilities Affect One-Fifth of All Americans. (Publication CENBR/97-5). Why Do I “Plug” Invisible Illness Awareness Week? 1) Folks through the training center at Fidos For Freedom. 4) Individuals in support groups for tinnitus, Meniere’s disease, hearing loss, and assistance dogs users (both face-to-face and in virtual environments online). Not every disability can be made visible. Not every person chooses to even try and make something invisible – visible. They have their reasons and it is an individual’s choice how they want to disclose or keep hidden any disabilities they may have. It could influence their work environment, relationships, and even self-esteem. I choose to support ALL individuals who live with chronic illness, invisible illness, or disability. Recognizing these illnesses once a year in a push for national awareness, I hope will eventually dispel erroneous ideas and information about these very populations. This is one of the reasons I “blog”, and invite guest authors to write for “Hearing Elmo” as well. Raising awareness makes a difference… one person at a time. I read some incredible stories of courage, faith, and perseverance this week at the national website for invisible illnesses. You can check out some of them here. I’m proud to be a part of a community of people who choose to live a victorious life – “in spite of”. Take some time this week if you can to recognize the courageous people that you know who live with invisible illness and the choices they have made in order to live life to its fullest! It is hard to believe we’ve seen the 10 Year Anniversary of “9-11” come and go already. It really put it into perspective for me when my 21-year-old daughter relayed an amusing anecdote to me. She had gone to Union Station to pick up “the boyfriend“. They walked around a bit before getting on the METRO and she spied a police car outside with “9-1-1” on the side. Because of the anniversary of 9-11, and a result of what I think those numbers MEAN to someone of her generation, she pointed at the car and said, “Oh look! I guess that is on there to commemorate the 10 year anniversary!” I think “the boyfriend” was hard pressed not to laugh. Hers is a generation that grew up without William Shatner and his “Rescue: 9-1-1” television show. Although 9-1-1 was covered in school, for her it left a permanent link to a different meaning other than how to call in the event of an emergency. For her, those 3 numbers meant something far different. She was old enough to understand that the world had changed for those here in the U.S.A., but young enough to experience different kinds of fear, anxiety, and apprehension experienced by parents and their peers. On 9-11 I was “only” hard-of-hearing at the time. The progressive loss and downward spiral of my own hearing had not left its life-changing mark as yet. However, even with my first hearing aid, I still relied on closed captioning. I think if I had to put my finger on ONE memory of 9-11, it would be being afraid and confused about what was happening because those professionals who did closed captioning were FREAKING OUT. At times, the closed captioning was just gibberish, and there was a great deal more of instantaneous corrections being made for “Live” television. When the first tower came down I remember sitting – quickly – STUNNED. Ten years later I am a different person. Hopefully, all of us can say we are “different” after a decade of life. Our goal should be to mature, learn, and even blossom. 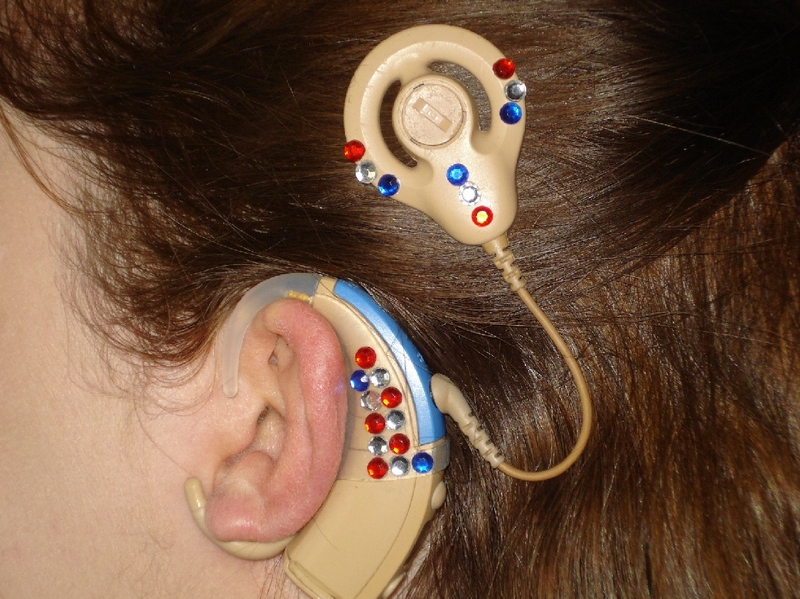 I am completely deaf now, but “hear again” through cochlear implant technology. Who I count as friends are peers who also live with hearing loss, live with invisible disability/illness, or work with those populations. Sometimes we live victoriously and sometimes there are setbacks. I have found a “community”, however, and they have become family and friends to me. I watched a number of specials about 9-11 and still used closed captioning. However, it was with some confidence that I also HEARD the commentary and watched the speeches at various memorials. I am grateful for my cochlear implant and for the privilege of living in America. Invisible if I want it to be, but I wear bling and use a service dog so that it is not. I was 6 years old after a car accident. Learning to hear with a cochlear implant and learning how to adjust on days my Meniere’s disease symptoms have me wobbling around with poor balance. My cochlear implant has “fixed me”. Not being able to hit “snooze” on my alarm clock since that happens to be my service dog, Chloe. When the alarm goes off, she kisses me awake and there is no going back to sleep. The dog is definitely a “morning dog”. Not really a medical show but I do like Dr. Phil. He’s a “reality therapist” and I think everyone who has an invisible illness needs to have a healthy dose of reality! Trying to ignore the tinnitus that comes roaring into play after removing my cochlear implant. 1 prescription (blood pressure) and 9 different vitamins – one of which is Manganese. Studies have shown that people with Meniere’s disease may have a Manganese deficiency. Have tried numerous ones including acupuncture, chiropractor, and vitamins. Visible – no question. This is why I try to make my invisible illness – VISIBLE. I am proud that I am able to work having made a number of adjustments and having chosen to be partnered with an assistance dog. That I dread group activities because I don’t hear as well as they think I do. That I must sometimes choose not to do things I once enjoyed because of my symptoms. For example: If there is a movie I wanted to see that is coming out, but the weather is bad and my Meniere’s disease has flared up, I cannot go and have to put it off. Go back to school and finish my MS. There are none. I’ve never seen a late-deafened/cochlear implant commercial, nor a commercial about Meniere’s disease. 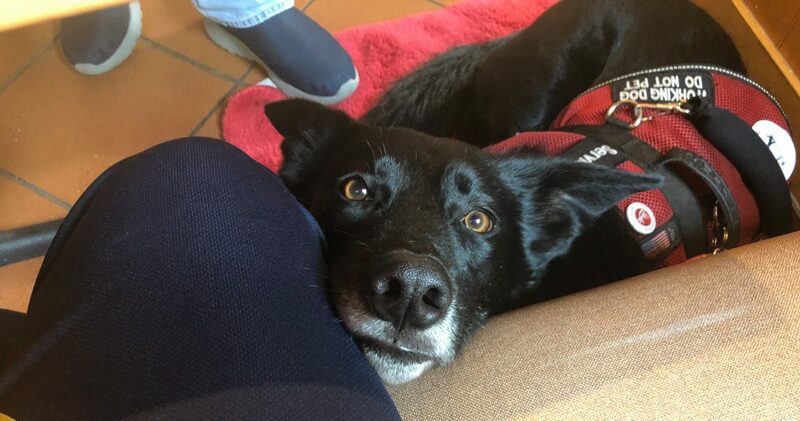 Friends who couldn’t cope with the new me accompanied by a service dog. Go to an amusement park and ride every roller coaster there! That the disability community is live and well and fully utilize the Internet to connect, support, share information and to be proactive. “Nevermind”. If you aren’t willing to repeat it for someone who hears differently are you not behaving as if it doesn’t matter to THEM? Email me. Ask questions. I want to help! How family members who once knew you “when” are not willing to learn about the new you. Email me and ask how I was doing. Many illnesses and disabilities are invisible. I want to raise awareness. Appreciative that you care enough to learn more!